In the latest display of canine loyalty, this precious and patient pup holds the toilet paper roll in his outstretched paws! This hilarious restroom accessory will most certainly be a conversation piece at your next home gathering! The sturdy cast resin piece is filled with detail and mounts to your cabinet or wall. 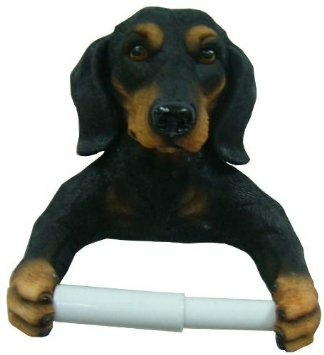 For more information about the dachshund dog toilet paper holder, click here.